In 2012, the BetOnline Internet poker room, sportsbook and casino brand purchased SportsBetting.ag. This significantly benefits US poker players, as BetOnline's management team has been delivering online gambling options since 1991. The previous team at SportsBetting.ag had some customer service issues, and was not considered anything more than an average Internet gambling portal. However, after the acquisition, BetOnline revamped the SportsBetting.ag website, which includes a sportsbook, racebook, casino and poker room. As a sister site of Betonline, Sportsbetting.ag is a name players can trust for honest gambling, fast payouts and fantastic 24/7 support. Players love playing at Sportsbetting.ag because they offer everything under 1 roof. Whether you want to play poker, bet on the Super Bowl or get into some online casino action, you can find exactly what you need. Is Sportsbettingag Poker Room Legitimate? 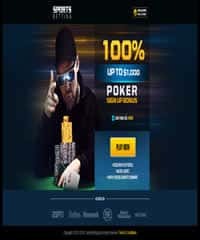 Yes, SBPoker is part of the Betonline family of sites making them one of the most reputable in the industry. Betonline and Sportsbetting.ag both have excellent reputations in the industry for being fair and honest with players and always paying out winnings accordingly. Yes, SBPoker uses the latest in SSL security technology ensuring that all private or sensitive information is kept hidden from prying eyes. They use the same level of security as one would expect to find at their online bank. Licensing And Certification - Is Sportsbetting.ag Poker Site Legal For American Players? Falling under the respected BetOnline umbrella of legally licensed Internet gambling options, SportsBetting.ag is a legitimate and legal online poker provider. Regulated and certified by the gaming laws of the Panamanian government, US players are legally accepted because they are located offshore. Internet and technological support in Panama is substantial. This means connectivity and Internet access is offered at a very high standard. SB Poker accepts players from all 50 states as well as other countries. As long as you are of legal gambling age in your particular jurisdiction, you can open a real money account at the SportsBetting.ag website. And when you plan on playing poker there, you benefit from a 100% matching bonus on deposits of $50 or more. This allows you to receive up to $1,000 as a free incentive for joining the site and making your first real money deposit. There are five easily achievable levels of Player Option Points which you accumulate that disperse your bonus, and you have as many as four months (120 days) to realize the maximum bonus. Additional bonuses include a 4 of a Kind Challenge which can earn you up to $40 cash during select games when you achieve that particular hand. Also, in case you score a Jack high flush or better and lose that hand, you are awarded up to $100 in cash for the Bad Beat Bonus. As a free play bonus, there are poker freerolls available every day. The poker games offered by SportsBetting.ag include the globally popular Texas Hold 'Em, as well as Omaha No Limit, Pot Limit and Fixed Limit, and Omaha Hi Lo. No Limit and Fixed Limit Hold 'Em tables are available all the way up to $5.00/$10.00, with Omaha offered at table stakes up to $1.50/$3.00. We mentioned above the daily freeroll tournaments which are offered, and satellite qualifiers, sit-n-go's, cash games of all types and $250,000 in guaranteed money tournaments are all available. While the site has increased its traffic dramatically under the new ownership, be forewarned that NL Hold´em Sit n Go action is slow outside of peak time. A Multi-table Leader board Challenge joins the previously mentioned Bad Beat Jackpot, 4 of a Kind Challenge and special seasonal poker games and tournaments (centered around events like March Madness and the Super Bowl) as special game offerings. Security at SBPoker is a top priority. The website has an entire team of security experts that ensure all security standards and SSL encryption protocols are constantly being met. They are a huge company with very deep pockets, so trust me they go out of their way to implement the latest technology on the market to ensure all sensitive data remains private. Sportsbetting.ag offers one of the best cashier's in the business. They have an excellent processor for credit cards who can get your Amex, Visa or Mastercard deposits approved when others can't. In addition they started accepting Bitcoin in 2016 which is a great way for USA players to get money both on and off the site. At the end of the day, Both Betonline and Sportsbettingag offer some of the easiest and fastest methods for both deposits and withdrawals. Does Sportsbetting.ag Offer A Mobile Poker Version Of The Software? No, their other products such as their sportsbook and casino platforms are mobile friendly. But they haven't quite finished development on their mobile poker product. It's in the works though and we expect this to be completed in 2017. Support is fantastic at SB Poker and is available 24/7 365 days a year. You can call them toll free at 1-888-843-9027 or email them anytime at poker@sportsbetting.ag. Offering access for PC and Mac users with a mobile poker product in development, the SportsBetting.ag poker room is one of the top 3 poker destinations for both USA and worldwide players. When you are tired of playing poker, or are just getting a bad run of cards, you can access their other gambling products such as their sportsbook or casino platforms. Multiple deposit and withdrawal methods mean you can always get money into and out of your account easily, and special seasonal bonuses and promotions are frequently offered to keep the site fresh. Whether you prefer Omaha or Texas Hold 'Em, cash games or tournaments, there are freerolls and players supporting most tables around-the-clock. The site provides legally licensed support for US players, which have limited choices due to current US online gambling laws. While the previous management did have its issues, the new BetOnline team has over 20 years of experience offering Internet wagering, and the SportsBetting.ag poker product has benefited because of this.